If you have access to some woodland or you are wanting to cut up some fallen branches or tree thinnings in you garden, you might like to save this timber to burn on a wood burning stove. 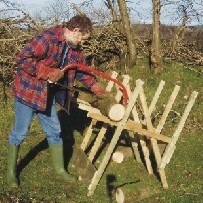 To do this often means moving each length of timber for each cut, often done with the log resting on another log near ground level, not exactly good for your back or very safe. 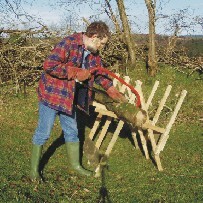 The LOGMATE was designed after many years of doing just that, bending down to cut timber while it was propped clear of the ground on another log. 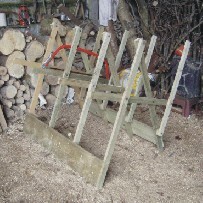 Even after finally making a conventional saw horse, I found I was constantly moving the log or turning it around for each cut. 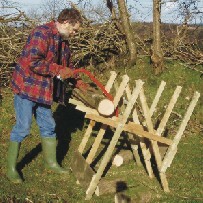 Looking at a toast rack one day I thought that if I made one about 10 times larger but shaped to rest logs along its length, I could cut one log into many pieces without having to move it. The LOGMATE was born! 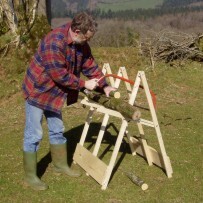 If using a hand saw like a bow saw, the log needs to be at a different height than when using a chainsaw. 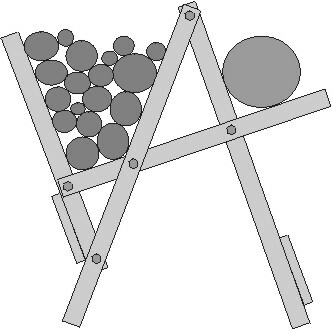 Also a bow saw cuts on the push stroke so the log has to be prevented from moving away from the operator while a chain saw cuts with the chain moving towards the operator so the logs need to be prevented from also moving towards the operator. 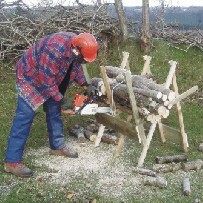 For these reasons, the LOGMATE is designed to be used from both sides, each side adapted for use with hand saws or power saws. The first prototype was a monster, ideal for estate workers, farms and larger workshops. 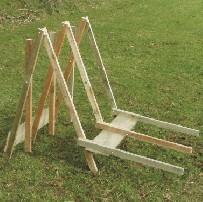 Inspite of its size is easy to move about when assembled but too heavy and awkward when folded. It is in use nearly every day in our barn but not suitable for folding for storage in a small garage. I then went to work on Mk2. Slight modifications but as Mk1 had been almost perfect, Mk2 was simply 2/3 the size. 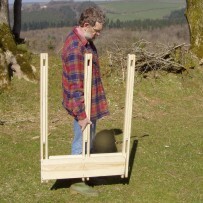 It folds for storage by removing three bolts. All LOGMATEs use flush fitting T-nuts and shallow raised head bolts to reduce the chance of accidental damage if the saw should be slightly off course. The cleat used to locate the shock chord used to retain bundles of small logs in the chain saw stack is brass and all screws are plated. Those purchased as complete units are made from treated timber so can withstand a certain amount of exposure to rain and damp. 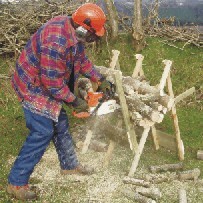 Whether cutting a large log on the hand saw side or cutting a stack of smaller logs on the power saw side, it is important to remove the ends before moving to cut between the supports. This maintains the weight within the Logmate and prevents it tipping over. 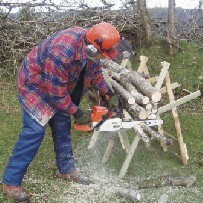 The hand saw side is fine for using with a power saw provided you follow the makers instructions and keep the saw in contact with the log at all times. 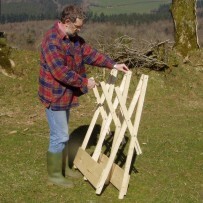 The LOGMATE frame is designed to cut logs of the correct length for your make of stove. If building one from a kit you will need to adjust the space between the supports. 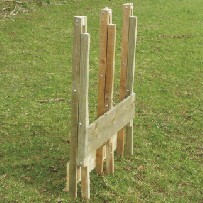 All LOGMATES can be ordered for logs of a specific length. Here are a few photos of the LOGMATE in use. A log of the size shown above needs careful handling because of its weight. 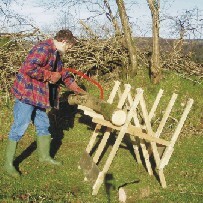 When using a bow saw it is often possible to complete a cut without the log moving as you can see above. 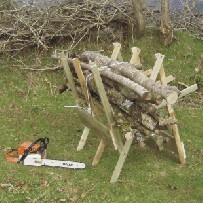 You can then hold one half of the log and use the saw to tip the other half off the LOGMATE. Weight is not so much of a problem when dealing with many smaller logs. 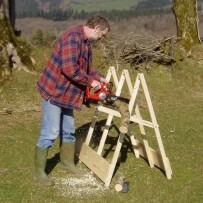 When loading up the power saw side it is better to choose those as straight as possible. If there is a slight curve to them, they should be arranged to nestle together before securing them with either a length of rope or shock chord or a strap. First cut through 10 logs. If wishing to place an order for a LOGMATE at £105 + £18 delivery please e-mail us at the link below. If wishing to purchase a kit with plans, full instructions and the special nuts and bolts, everything you need except the timber, then these can be purchased for £15 incl. P&P. There will soon be a list of all spares should you need the odd nut, bolt or screw. 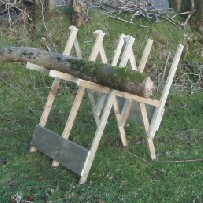 Whilst the original Logmate is still in daily use and folds for seasonal storage, I found there was a need for one that folded quickly and was light enough to carry about. I decided to modify Logmate Mk1 by doing away with the 'chainsaw' side and creating a slot in the supports so it would fold as quickly as a folding chair and is nearly as light. 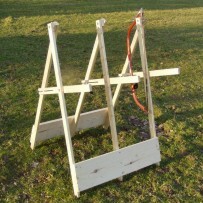 The following photos demonstrate it in use. The LOGMATE Folder is available for £85 + £15 p+p. The Hepworth Logmate is a Carbon Trapper Product - Undoing The Past for Our Future!